My thanks go out to Derrick Belanger of Belanger Books, Ltd for my review copy of this collection! Thanks a lot, my friend! Have you ever thought of shaking your Family Tree but were afraid of the nuts that might fall from it? That is the premise of this delightful collection of horror, mystery, and the downright macabre. Chastity Willingham Dinsdale has a bundle of stories from her ancestors; uncles, aunts, siblings, and cousins removed—but never far enough! 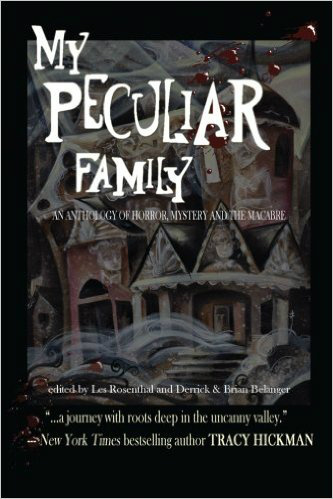 Some of the tales are mysteries concerning family members who perhaps vanished without explanation, or were covering a secret that only now can be revealed. Some of the tales are bone chilling horror, people who have faced choices and fates that are terrifying. Some tales fall into the category of just plain weird, inexplicable stories that shouldn’t exist about experiences and events that defy attempts to sort them out. There are nineteen authors represented in this volume. Their stories vary, some told second or third person and some first person accounts. If I pointed out anything it would be how the stories make a very cohesive volume. There are no stories that do not fit the given theme. They are all individual accounts, but each story tells a part of the bigger story, the Dinsdale Family Tree. If I chose one story as the prize of the anthology, it would be “Crownshield’s Apothecary” by Rob Watts. Watts gives us the tale of Calvin Crownshield, a man with a past that catches up to him in the end.